My dad and I have started creating some workshop manuals that accompany the NORTON Workshop Manual to help make it easier to work on the 961 Commando. It's going to take time to get to every subject matter but in time it will get there. 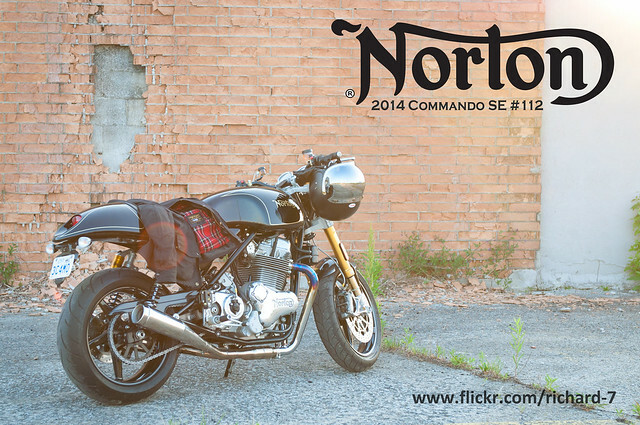 They are in sections and some work together and some, like the Head Torque, will be in addition to the NORTON Manual for specs and patterns. They don't cost anything and you can share them with anyone you know, but if you feel they have saved you some cash and frustration and you would like to make a donation to my paypal account that would be fantastic. This will help me justify the time it takes to create them and give them away. If you would like me to email you a PDF copy, just PM me your email address until I can find a place to host them for free download. I'll keep adding to this list as more are complete. I was going to wait until they were all finished but bike season is here and the last thing we need is being off the road for something we can fix ourselves. If you have anything to add or change, post it here and just general comments post them here too. Don't be shy if you feel something is missing. This is to help everyone and your feedback is the only way they will improve. PS - This manual is more for people who have a general understanding of mechanics. If you don't have a good understanding of mechanics and are not generally inclined to take things apart just to see how they work, then proceed with caution and/or take your bike, the Norton Workshop Manual and my manuals to someone who does. AB2501 and Colin1980 like this. Please email me the pdf, my head is weeping oil from the front of the gasket at about 1200 miles, the head torque section is of interest to me. I have searched the owner's manual and the factory shop manual and have not seen any mention about periodic head torqueing, am I missing something? Richard please send me the cylinder head torque pdf. Here's my email for the pdf's. Thanks!! Hi Richard! Could you please send me the pdf's? I tried to PM you but I couldn't seem to make it work. If it is not to much trouble. I am interested in the head torque (head gasket sweating like others) and everything to get to the clutch. Mine is very noisy (must admit i got used to it). But now it does not disengage smoothly anymore either. Do you have another email address? a few bounced back because your email has a max attachment limit. Do you have the stock exhaust in place? I got 4 of them and they are really great! Thanks for the effort. Glad they are helpful, thank you for all the replies, comments, and donations. If you posted your email on public forum, just go back and edit it out if I've sent them to you. No need for extra spam in your mail box. Here's some pics I took last night. Two fantastic products that go well together. 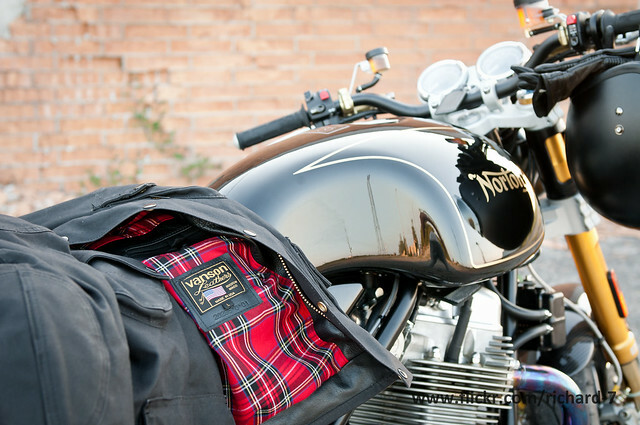 A Norton and a Union Garage Robinson Jacket. Richard, please send me the PDF to my email address at cealawyer@aol.com. Thanks. The transmission Venting is something we feel Norton either missed or we cannot locate, there isn't an off the shelf thing you can buy to do this. However, if you are handy, this manual will guide you in what to do and you will easily be able to make your own. From an engineering viewpoint, its the reason why starter gaskets are leaking oil. (Maybe not tho...) Also, in that manual it shows the AIRBOX TEMP. SENSOR -- If anything else, use dielectric grease on that connection because as you can see from the photo, it's in a valley with no where for water to go when washing the bike or in rain. If and when that corrodes, you will have a small nightmare on your hands. ALSO, make sure you remove your gas tank and make sure the MAIN FUSE has a ZIP TIE around it. Also not a bad Idea to pack with dielectric grease. from the crankcase seam too? Not huge amounts. Maybe a tablespoon every 50 miles or so. My level hasn't dropped significantly over the last 400 mi. Maybe 5-6 MM on the dipstick. Any chance you could send a set of manuals down under .